Quickly setup your wire spools on-site without unnecessary bulk! The DeCoil-Zit is a collapsible wire reel/spool holder that can be quickly assembled or disassembled for on-site use and easy storage. This spooler handles up to 25" diameter reels. This spooler consists of two heavy duty tempered steel tripods, welded and finished in tough, purple powder coat finish that slide together with standard 1/2" conduit to form a stable platform for your wire reels (reel/spool not included). 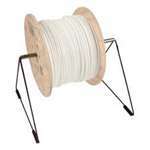 Great for using spools of cables when pulling of by yourself. Used for Communication reels/ spools.